Songs featuring Sia, Ellie Goulding, Hailee Steinfeld, Miike Snow and others will appear on the official soundtrack for Fifty Shades Freed, the track list for which has just dropped. The 22-song compilation includes “Capital Letters” by Hailee Steinfeld x BloodPop, “Sacrifice” by Black Atlass featuring Jessie Reyez, “High” by Whethan & Dua Lipa and, of course, Liam Payne and Rita Ora’s lead number “For You,” which arrived last Friday. The Fifty Shades Freed soundtrack will be released Feb. 9, with preorders available from this Friday (Jan. 12). Its predecessor, the soundtrack to Fifty Shades Darker, debuted at No. 1 on the Billboard 200 last February. The forthcoming film, the final in the Fifty Shades trilogy, also hits theaters Feb. 9. We still haven’t gotten a full album from Hailee Steinfeld, but she’s just scored her third top 40 hit — and she did it with a song that she admits “seemed a bit left field” at first. 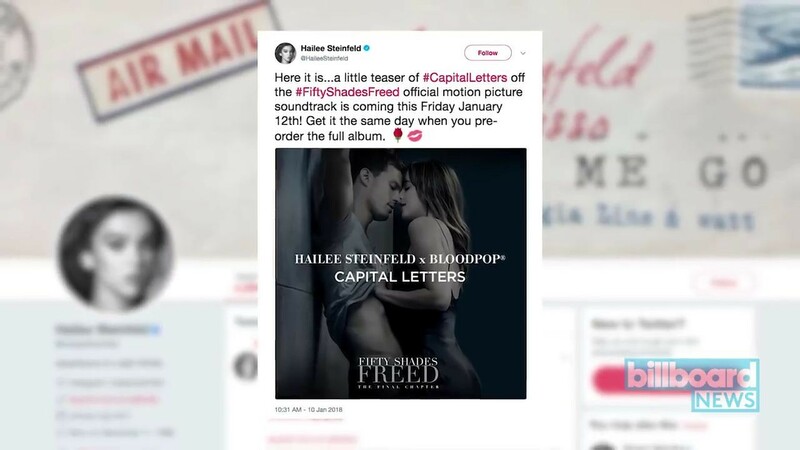 On top of that, Hailee’s releasing a new song on Friday: “Capital Letters,” a collabo with Bloodpop that appears on the Fifty Shades Freed soundtrack. Hailee teased the upbeat track, which you’ll get as an instant grat track with the soundtrack album pre-order, on Instagram.